You know, sometimes it is hard to find time to do this blogging thing, or else there just isn't anything going on that is that interesting. 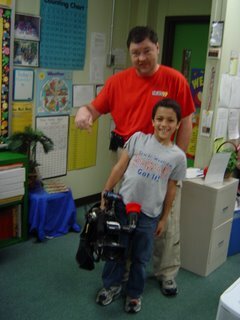 So, this isn't that interesting, but here is a picture of your faithful photog blogger with a future photographer at Guntersville Elementary school. Maybe one day he can have my job and I'll be able to retire to the Old Bureau Photographer's Home. watch out he might be taking your job soon.